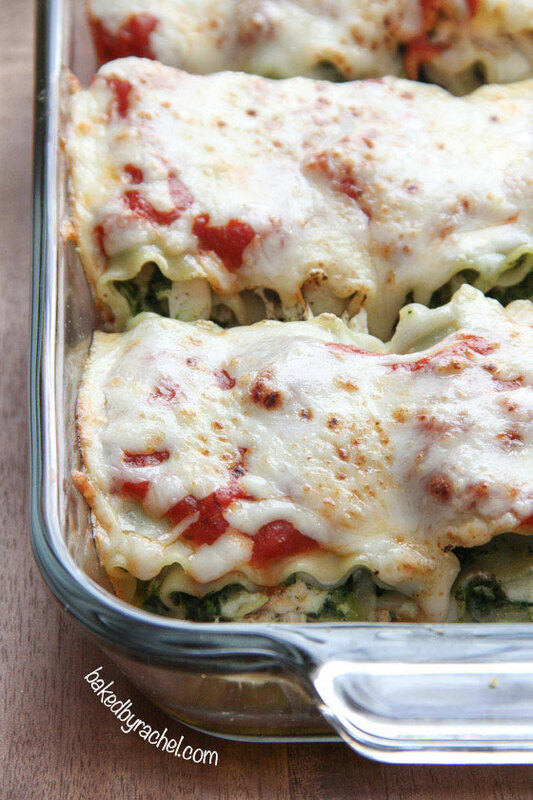 An easy and fun twist on a traditional lasagna dish featuring rolls of pasta with a homemade pesto sauce, cheese and seasoned chicken. A prettier presentation for a delicious dish! Normally when I have music on, I’m bouncing between stations on Pandora…Glee, Kate Voegele, Pink and Kelly Clarkson are the typical stations. And bouncing between them is a must because one can only skip or thumbs down so many songs. I find that kind of annoying when I’m already paying for ad free music but whatever. Only instead of doing my usual, the other night I decided to play Clare Bowen songs on repeat (aka Scarlett from Nashville). She has such a fun and unique voice. I guess I’m just obsessed with the singing and drama from the show. I was honestly even tempted to buy the soundtrack when I saw it at Target recently. They almost sucked me in again… Target does that so easily, but I resisted. Are you watching the show? Please say yes. Seriously guys, have you listened to this song? Do it. I love it. What I also love and am totally obsessed with is having fresh basil around the house for the first time ever. It’s pretty awesome. 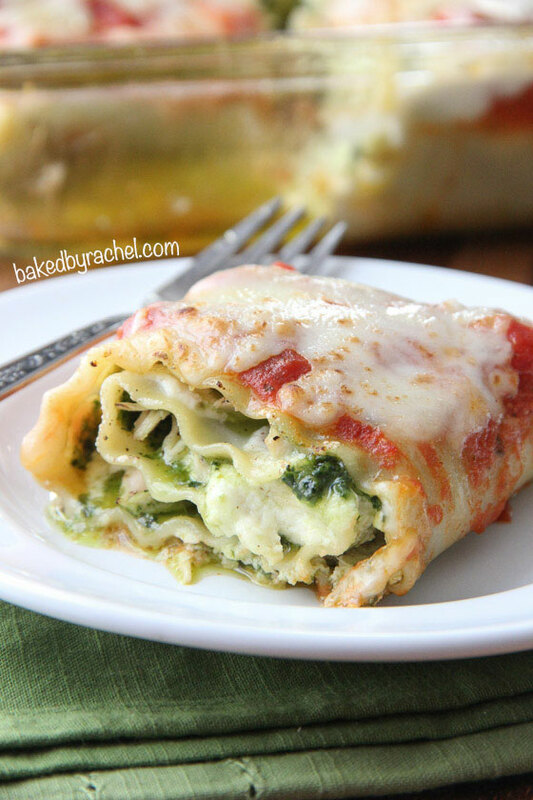 Grab some fresh basil, or prepared pesto if you prefer, and whip these up these pesto chicken lasagna rolls! Who doesn’t love lasagna? Or pesto for that matter? So I combined them into one easy, cheesy flavorful meal. Lasagna rolls are easily portioned out and won’t slide off of the serving piece like typical lasagna does, so you’re still left with a pretty presentation. A great dinner for any night of the week! 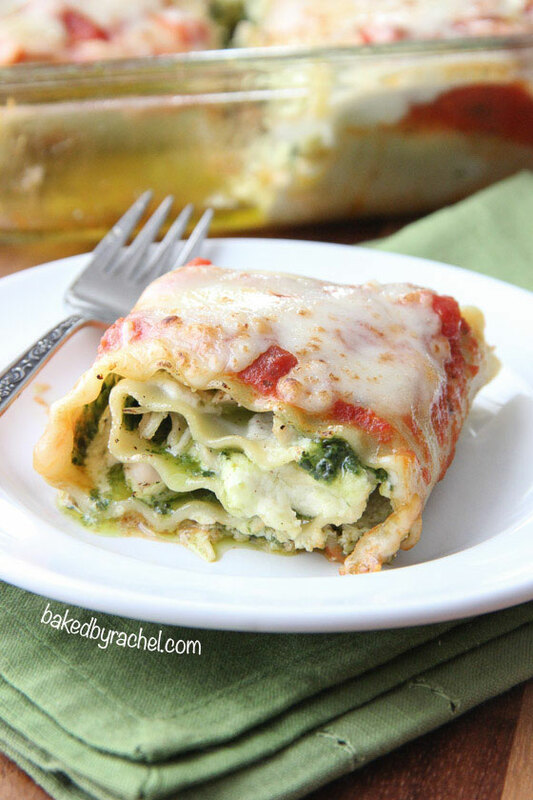 An easy and fun twist on a traditional lasagna dish featuring rolls of pasta with a homemade pesto sauce, cheese and seasoned chicken. Bring a large stockpot of water to a boil, cook 9-12 lasagna noodles according to manufacturer's directions. In the bowl of a food processor, combine basil leaves and garlic. Blending until only fine pieces remain. Add in cheese. With food processor running, slowly drizzle in olive oil until desired spreadable consistency is reached. Transfer to a small bowl, set aside. In a medium bowl, combine ricotta cheese with egg, Parmesan, salt and pepper (to taste). Working one or two noodles at a time, lightly coat with pesto sauce, followed by ricotta mixture and shredded chicken. Roll and place in a rectangular baking dish. Repeat process with remaining ingredients. 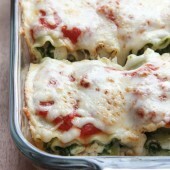 Cover with tomato sauce and shredded mozzarella. Bake at 350°F for 30 minutes or until cheese is fully melted. For a quick cooking method, add chicken breast to a small saucepan and enough chicken broth or water to cover chicken. Cook over medium heat, flipping once, until chicken is cooked through and no longer pink. Shred and season with salt and pepper.